A few updates for this. We had a photo of the logo, now we have a proper image, even though it's low resolution. 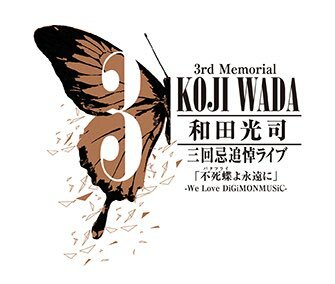 Wada Kouji Memorial Live "Immortal Butter-Fly Forever" -We Love DiGiMONMUSIC- will be held August 30th at the Zepp Tokyo as a two part concert event to celebrate Wada Kouji. Part 2 is a live concert. Doors open at 7pm. No starting time is given. Also, as they mentioned last week, more tickets are being made available. Ticket prices are 6,800 yen for 1st floor standing room only (2nd floor reserved seating is sold out.) Drinks with tickets will be 500 yen. Tickets can be reserved between June 28th and July 20th at Lawson Ticket. Results of the reservation will be announced on July 10th. Payment deposits are due between July 10th and 16th. 2 tickets per person, elementary school aged children will not be allowed in. More details, including the guest lineup can be found here. All 7 series that Wada Kouji was involved in. Outside of the LE release of Hacker's Memory last year, Xros Wars has generally been left out of events and releases of multiple series due to the music being handled by a different company. Updated with info on which parts of the franchise will be represented in the concert.